Formed out of the rhythmic core of his famed Red Orchidstra (whose version of the theme from the seminal '71 Brit gangster movie Get Carter is acknowledged as a groove classic) BB DAVIS' MYSTERIES OF THE REVOLUTION is a collaboration between long-time musical associate French virtuoso keyboardist DAN BIRO and the much sought after UK bassist MARK SMITH. BB DAVIS, whose largesse and unmistakable electric performances are legendary, has grown in stature from the underground and whilst MOTR's eponymous album, in part, evokes the spirit of 70's fusion psychedelica electronica such as Miles, Herbie H, Zawinul and Lifetime, it's also a journey of intense emotional, passionate instrumental playing by all three protagonists who firmly place their own individual, indelible stamp on the music. Journeying from the light--the chorale intro to Welcome--through to the dark weirdness of Moonfrog's Tucker [a slight caress to Beefheart] the album takes a semi-filmic mystical/urban ride to the apocalyptic Have You Seen Enough? thence backing into the light once more with the ethereal end-piece Evolution. Whether it be the earnest, full-on, passionate Hammond growling of The Crunch, the subtle, driving Romantica, the Arabic flavoured Secret Fire [inspired by a stay in the Moroccan old port city of Essaouira] the uniquely enigmatic 'The Elevation Of Mr Handy' or the slinky vibe of Storius Sensorius each track displays the unit's oneness and sense of purpose. As well as its retro-psychedelic experimentation the album also features BB's tour-de-force flute/beatvox piece Big Buddah [dedicated to one of his greatest influences Roland Kirk] which continues to stun audiences everywhere. But MOTR's not on any overt nostalgia trip. Far from it. Sure, the influences are there, but equally it's about sonic energy, edgy, powerful compositions, and as the packed audience at MOTR's London album launch will testify it's about MOTR creating their own revolution. With BB's drumming and multi-instrumentalism powering the band, DAN BIRO's dazzling keyboard work and MARK SMITH's consummate bass playing they're truly a force to be reckoned with and well on course to do just that! All About Jazz musician pages are maintained by musicians, publicists and trusted members like you. Interested? 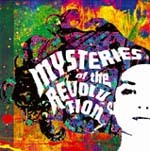 Tell us why you would like to improve the Mysteries Of The Revolution musician page.